Last week my wife and I, along with a friend, took a tour of some of the more impressive mausoleums in Brooklyn's Green-Wood Cemetery. Following the guided tour, about which I'll be blogging more in the near future, the three of us went to Battle Hill, the highest point in the cemetery grounds (indeed, the highest natural point in Brooklyn. 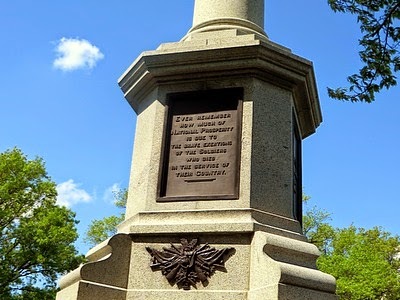 It was the site of an important engagement in the Battle of Brooklyn (sometimes called the Battle of Long Island, as the area in which the fighting took place was not yet part of Brooklyn). The battle was the first engagement of George Washington's Continental Army against the Royal Army, and was a defeat for the Americans. It could have spelled the end for the young Revolution, but for some heroic rear guard actions, including that at Battle Hill, and a stroke of luck, in the form of bad weather, that allowed what remained of Washington's forces to retreat from what is now my neighborhood to Manhattan, then to New Jersey, then to Valley Forge, Pennsylvania, where they endured a harsh winter before re-crossing the Delaware and enjoying their first victories at Trenton and Princeton. The monument in the photo above is topped by a statue of Minerva,"the Roman goddess of battle and protector of civilization." 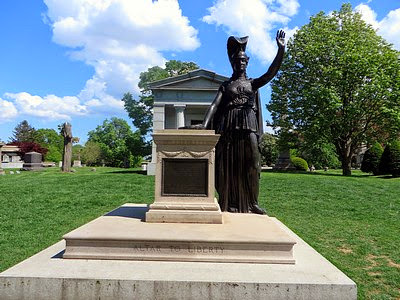 She faces toward, and waves to, the Statue of Liberty, which can be seen from Battle Hill. On the face of the base below the statue are the words, "Altar to Liberty." The mausoleum behind belongs to the family of Charles Higgins, the ink manufacturer who funded the monument. 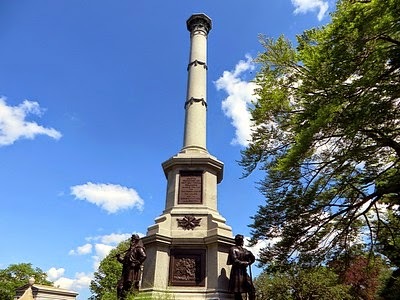 There is also a Civil War monument (photo above) on Battle Hill. Ever remember how much of National Prosperity is due to the brave exertions of the Soldiers who died in the service of their Country. Planxty: "Raggle Taggle Gypsy/Tabhair dom do lámh"
This is great stuff. I've loved Planxty (about whom I've posted before) since I got a copy of The Planxty Collection at a little shop, no doubt long gone, somewhere on Bleecker Street between Sixth Avenue and Christopher Street, in the late 1970s. I especially like this medley of two songs. Cut to Athens, fourth century B.C. In his Symposium, Plato refers to an attempt made by Orpheus, mythical poet and son of Oegrus the harper and Muse Calliope, to rescue his wife from the land of the dead. This is the earliest known mention of Orpheus's wife, Eurydice, and of his adventure in the lower world. It's also the beginning of "Black Jack David." Nick then traces the Greek Orpheus legend* through various developments by the Roman writers Vergil, Ovid, and Boethius. Nick writes, "It was King Alfred's ninth-century translation of Boethius that ushered the Orpheus myth into medieval Britain." After this, Nick follows its development into poems and ballads in various parts of the British Isles. He notes a syncretic development in Ireland, where the story melds with pre-existing Celtic legends. Such are the roots of the many songs about the abduction and failed attempt to recover a nobleman's wife, or sometimes daughter, that include "Back Jack David" and "The Raggle Taggle Gypsy." 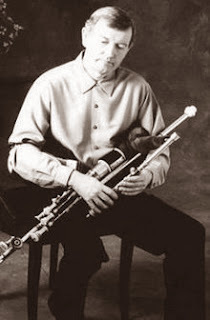 From "The Raggle Taggle Gypsy" Planxty segues into Tabhair dom do lámh, an instrumental featuring Liam O'Flynn (photo at left) on uilleann pipes. This enchanting tune is credited by Bunting in Ancient Music of Ireland to Ruairí Dall Ó Catháin, a chieftain from County Tyrone whose reputation for skill as a harper and composer may be second only to that of the great Turlough O'Carolan. The story behind Tabhair dom do lámh, as told in Ask About Ireland, is that Catháin was traveling in Scotland when a noblewoman, Lady Eglinton**, thinking him to be a simple itinerant musician, demanded that he play a tune. Angered by her effrontery, Catháin refused. When Lady Eglinton learned of his high status, she apologized, and he composed Tabhair dom do lámh for her. My friend Larry Kirwan's band Black 47 gives the translation of Tabhair dom do lámh as either "Give me your hand" or "Let's be friends." Another source, Donal O'Sullivan, in his Carolan: The Life, Times, and Music of an Irish Harper, quoted by "Sarah" in the comment thread under a post about the tune in The Session, in turn quotes Arthur O'Neill as claiming Catháin's original title for it was the Latinized Da mihi manum, which also translates as "Give me your hand." The tune was later used for an Irish rebel song, "White, Orange and Green" (the colors of the Irish flag) which you can hear by Spailpin here. Later, the Wolfe Tones performed it as "Give Me Your Hand," with lyrics that seem both a simple love song and a plea for reconciliation between the sectarian factions in Northern Ireland; hear it here. I've read the following regarding this tune: Note that the tune is pentatonic until the final phrase. The mixolydian seventh appears four measures from the end, while the fourth does not appear until the final measure. Maybe this explains why, when I asked the uilleann piper who played at our wedding if he could play Tabhair dom do lámh, he politely declined, saying it was too difficult. The musicians in the video above, other than Liam O'Flynn on the pipes, are: Christy Moore on guitar and vocal; Andy Irvine on tenor mandola (I was introduced to Andy by my date following his solo performance at the old Eagle Tavern on West 14th Street in 1989, and later learned that my future wife and her date were there the same evening); and Dónal Lunny on Irish bouzouki (as the linked Wiki tells, Lunny owned the first bouzouki specifically made for use in Irish music; he later became a member of The Bothy Band). *The Orpheus legend bears an interesting resemblance to the Biblical story of Lot and his wife. In the Orpheus tale, the hero is told that he may lead his wife back to the land of the living so long as, on the way, he does not turn to look at her. He does, and she disappears. In the Bible story, Lot and his wife are allowed to escape the destruction of Sodom on the condition that they not look back toward the doomed city. She does, and is turned to a pillar of salt (Genesis 19:26). **The linked source spells her name "Eglington"; others spell it "Eglinton," which I think is correct. There is an Eglinton Castle in North Ayrshire. Farewell to the old Tampa home. 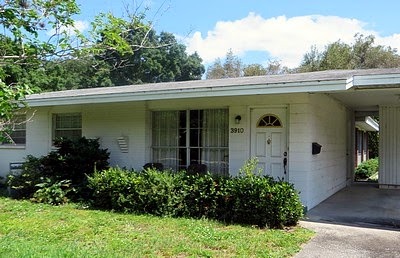 Last weekend we made a brief visit to Tampa, staying with friends across the street from the house that had been my parents' and my home for many years (photo above). Note the English sunrise on the door. That isn't the original door. When my parents bought the house in 1957, it had jalousie windows, as did the door. They replaced the windows and door when they had central air conditioning and heat installed in the 1970s. 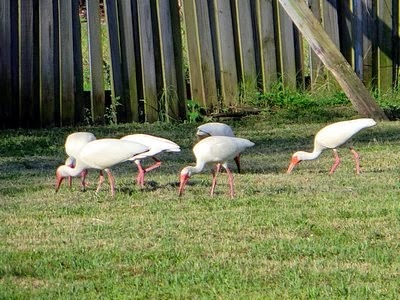 White ibises were feeding in the back yard next door. 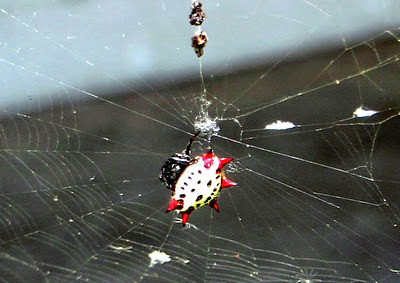 This boldly marked crab spider had spun a cobweb near the carport. We visited some other friends who live in a high rise building on Harbour Island. 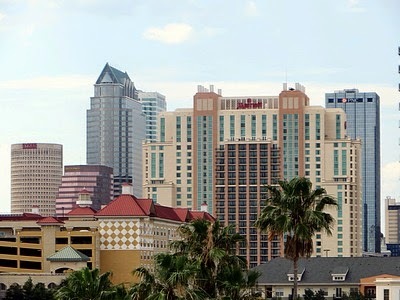 This is the view looking toward downtown Tampa from their terrace. 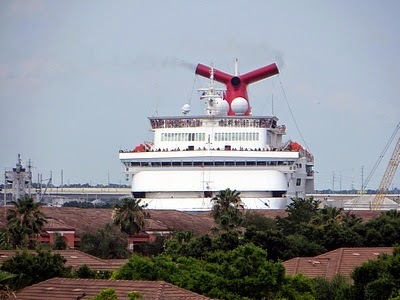 While we were there, several horn blasts alerted us to the departure of Carnival Paradise from the nearby cruise ship terminal. In this photo, the ship appears to be headed toward our friends' apartment as it turns to head out the channel to Tampa Bay. At the left of the photo you can see the funnel and masts of the World War II vintage cargo ship American Victory, on which my late friend Paul Schiffman served as an officer on its maiden voyage. The ship is preserved as a museum and docked near the Florida Aquarium, a favorite place for both my daughter and me. Crossing our hosts' lawn, I saw something scurrying. 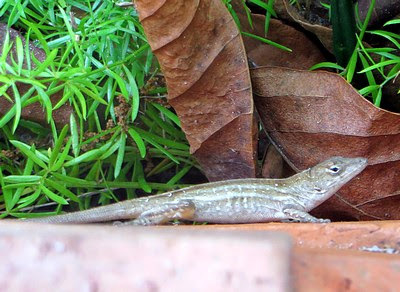 I looked down, and saw this anole lizard clinging to the side of a plank. Our return flight was delayed because of runway maintenance at New York's JFK Airport. 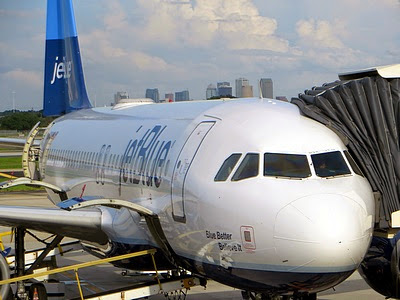 While we waited, I took this photo of our plane sitting at the gate, with the towers of downtown Tampa beyond. 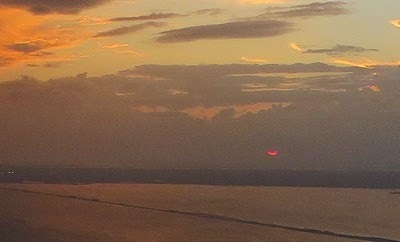 We took off heading southward; the setting sun appeared as a crescent through the clouds. Below is Old Tampa Bay and the Courtney Campbell Causeway. 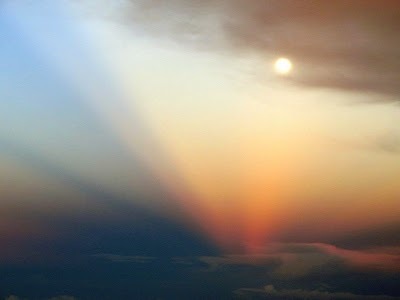 After we turned northward, the moon could be seen in a brilliant sky.